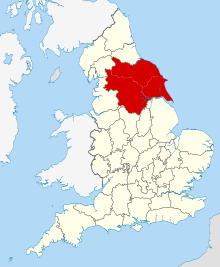 The Yorkshire dialect (also known as Broad Yorkshire, Tyke, Yorkie or Yorkshire English) is an English dialect of Northern England spoken in the English county of Yorkshire. The dialect has roots in older languages such as Old English and Old Norse. The Yorkshire Dialect Society exists to promote use of the dialect in both humour and in serious linguistics; there is also an East Riding Dialect Society. Yorkshire is generally not as stigmatised as other regional dialects, and has been represented in classic works of literature such as Wuthering Heights, Nicholas Nickleby and The Secret Garden. Studies have shown that accents in the West Riding (that is, mostly, modern West and South Yorkshire) are well-liked among Britons and associated with common sense, loyalty, and reliability. Traditionally, there was not one dialect in Yorkshire but several. The Survey of English Dialects identified many different accents in Yorkshire. The Yorkshire Dialect Society draws a border roughly at the River Wharfe between two main zones. The area to the southwest of the river is more influenced by Mercian dialect whilst that to the northeast is more influenced by Northumbrian dialect. The distinction was first made by A. J. Ellis in On Early English Pronunciation. It was approved of by Joseph Wright, the founder of the Yorkshire Dialect Society and the author of the English Dialect Dictionary. Investigations at village level by the dialect analysts Stead (1906), Sheard (1945) and Rohrer (1950) mapped a border between the two areas. Over time, speech has become closer to Standard English and some of the features that once distinguished one town from another have disappeared. In 1945, J. A. Sheard predicted that various influences "will probably result in the production of a standard West Riding dialect", and K. M. Petyt found in 1985 that "such a situation is at least very nearly in existence". However, the accent of Hull and East Yorkshire remains markedly different. The accent of the Middlesbrough area has some similarities with Geordie. One anomalous case in the West Riding is Royston, which absorbed migrants from the Black Country at the end of the 19th century. The speech of Royston contrasts with that of nearby Barnsley, as it retains some Black Country features. Wilfred Pickles, a Yorkshireman born in Halifax, was selected by the BBC as an announcer for its North Regional radio service; he went on to be an occasional newsreader on the BBC Home Service during World War II. He was the first newsreader to speak in a regional accent rather than Received Pronunciation, "a deliberate attempt to make it more difficult for Nazis to impersonate BBC broadcasters", and caused some comment with his farewell catchphrase "... and to all in the North, good neet". Some features of Yorkshire pronunciation are general features of northern English accents. Many of them are listed in the northern English accents section on the English English page. For example, Yorkshire speakers have short [a] in words like bath, grass and chance. The long [ɑː] of southern English is widely disliked in these words. Words such as strut, cut, blood, lunch usually take [ʊ], although [ə] is a middle-class variant. Words are shortened such as with to wiv, to to t' etc. Most words affected by the trap-bath split in South East England – the distinction between the sounds [a] and [ɑː] – are not affected in Yorkshire. A much smaller number of words, however, such as can't, half, and rather, are pronounced in a similar way to the South East. With the exception of Sheffield and Rotherham, the [ɑː] vowel is typically realised as [aː] or [äː] in Yorkshire. In parts of the West Riding, none, one, once, nothing, tongue, among(st) are pronounced with [ɒ] rather than [ʊ] A shibboleth for a traditional Huddersfield accent is the word love as [lɒv], pronounced to rhyme with "of". Words such as late, face, say, game are pronounced with a monophthong [eː] or [ɛː]. However, words with gh in the spelling (e.g. straight, weight), as well exclamations and interjections such as hey and eh (the tag question), are usually pronounced with a diphthong [ɛɪ]. Some words with ake at the end may be pronounced with [ɛ], as in take to tek, make to mek and sake to sek (but not for bake or cake). Words with the Received Pronunciation vowel /əʊ/, as in goat, may have a monophthong [oː] or [ɔː]. In a recent trend, a fronted monophthong [ɵː] is common amongst young women, although this has been the norm for a long time in Hull (where it originates from). It has developed only since 1990, yet it has now spread to Bradford. In the West Riding, there may be a split whereby a diphthong [ɔʊ] coexists in other words, especially where it precedes /l/ or where there is a W at the end of a word (e.g. grow, low, yellow). The O's in some specific words are pronounced alternatively as simply [ɔ], such as open, over, woke, and go. If a close vowel precedes /l/, a schwa may be inserted. This gives [iəl] for /iːl/ and (less frequently) [uəl] for /uːl/. When /ɛ/ precedes /r/ in a stressed syllable, /ɛ/ can become [ə]. For example, very can be pronounced [vəɹɪ]. In Hull, Middlesbrough, and other parts of the east coast, the sound in word, heard, nurse, etc. is pronounced in the same way as in square, dare. This is [ɛː]. The set of words with /ɪə/, such as near, fear, beard, etc., may have a similar pronunciation but remains distinctive as [eɛ]. In other parts of Yorkshire, this sound is a short [ə]. This seems to have developed as an intermediate form between the older form [ɒ] (now very rare in these words) and the RP pronunciation [ə:]. In Hull, Middlesbrough and much of the East Riding, the phoneme /aɪ/ (as in prize) may become a monophthong [aː] before a voiced consonant. For example, five becomes [faːv] (fahv), prize becomes [pʰɹaːz] (prahz). This does not occur before voiceless consonants, so "price" is [pʰɹaɪs]. In some areas, especially in the southern half of Yorkshire, there is a tendency to pronounce the diphthong /aʊ/ (as in mouth) as a monophthong [aː] (mahth). This is characteristic of informal speech and may coexist with the more formal [aʊ]. In Hull, the offset of /aʊ/ is strongly labialised. It occurs more in specific words – such as down, about, now, how, and out – than others. In the northern half of Yorkshire, the local pronunciation of these words is [u:], but this is now less common than the RP [aʊ] in North Yorkshire. Words like city and many are pronounced with a final [ɛ~e] in the Sheffield area. What would be a schwa on the end of a word in other accents is realised as [ɛ] in Hull. A prefix to a word is more likely not to take a reduced vowel sound in comparison to the same prefix's vowel sound in other accents. For example, concern is [kʰɒnˈsɜːn] or [kʰɒnˈsɛːn], rather than [kʰənˈsɜːn]. Long vowel [iː], in words like fleece or plea, is typically a diphthong [ɪi]. /ɔː/ is often realised as a slightly lowered /ɒː/ (i.e. 'Yoksher'). Long vowel [uː] in words such as book, cook, and look. [eɪ] may take the place of /iː/, especially in words such as key, meat, speak. Words such as door, floor, four may take a variety of diphthongal pronunciations [uə, oə, ɔə, ʊə]. Words which once had a velar fricative in Old and Middle English may have [oʊ~ɔʊ] for /ɔː/ (e.g. brought, fought, thought). Some words that end -ight can still be heard in their dialectal forms. For example, night as [niːt] (neet) and right as [ɹiːt] (reet) or, in some areas, [ɹeɪt] (reyt). This can also be heard in Nova Scotia. In some areas, an originally voiced consonant followed by a voiceless one can be pronounced as voiceless. For example, Bradford may be pronounced as if it were Bratford, with [t] (although more likely with a glottal stop, [ʔ]) instead of the [d] employed in most English accents. Absolute is often pronounced as if it were apsolute, with a [p] in place of the [b]. As with most dialects of English, final [ŋ] sound in, for example, hearing and eating are often reduced to [n]. However, [ŋɡ] can be heard in Sheffield. H-dropping is common in informal speech, especially amongst the working classes. Omission of final stops /d, t/ and fricatives /f, θ, ð/, especially in function words. As in other dialects, with can be reduced to wi, especially before consonants. Was is also often reduced to wa (pronounced roughly as "woh"), even when not in contracted negative form (see table below). A glottal stop may also be used to replace /k/ (e.g. like becomes [laɪʔ]) at the end of a syllable. In the Middlesbrough area, glottal reinforcement occurs for /k, p, t/. Most Yorkshire accents are non-rhotic. At the time of the Survey of English Dialects, fully rhotic accents could be found in Swaledale, Lonsdale, Ribblesdale, and the rural area west of Halifax and Huddersfield, and the accents on the east coast of Yorkshire were rhotic when /r/ is in final position but not in pre-consonantal position. Th-fronting so that [f, v] for /θ, ð/ (although Joseph Wright noted th-fronting in the Windhill area in 1892). T-glottalisation: a more traditional pronunciation is to realise /t/ as [r] in certain phrases, which leads to pronunciation spellings such as gerroff. In Sheffield, cases of initial "th" /ð/) become [d]. This pronunciation has led to Sheffielders being given the nickname "dee dahs" (the local forms of "thee" and "thou"/"tha"). Initial /ɡ, k/ realised as [d, t] before /l/). For example, clumsy becomes [tlʊmzɛ]. These features can be found in the English Accents and Dialects collection on the British Library website. This website features samples of Yorkshire (and elsewhere in England) speech in wma format, with annotations on phonology with X-SAMPA phonetic transcriptions, lexis and grammar. See also Wells (1982), section 4.4. A list of non-standard grammatical features of Yorkshire speech is shown below. In formal settings, these features are castigated and, as a result, their use is recessive. They are most common amongst older speakers and amongst the working classes. Definite article reduction: shortening of the to a form without a vowel, often written t'. See this overview and a more detailed page on the Yorkshire Dialect website, and also Jones (2002). This is most likely to be a glottal stop [ʔ], although traditionally it was [t] or (in the areas that border Lancashire) [θ]. Some dialect words persist, although most have fallen out of use. The use of owt and nowt, derived from Old English a wiht and ne wiht, mean anything and nothing, as well as summat to mean something. They are pronounced [aʊt] and [naʊt] in North Yorkshire, but as [ɔʊt] and [nɔʊt] in most of the rest of Yorkshire. Other examples of dialect still in use include flayed (sometimes flayt) (scared), laik (play), roar (cry), aye (yes), nay (emphatic "no"), and all (also), anyroad (anyway) and afore (before). When making a comparison such as greater than or lesser than, the word "nor" can be used in place of "than", e.g. better nor him. Nouns describing units of value, weight, distance, height and sometimes volumes of liquid have no plural marker. For example, ten pounds becomes ten pound; five miles becomes five-mile. The word us is often used in place of me or in the place of our (e.g. we should put us names on us property). Us is invariably pronounced with a final [z] rather than an [s]. Use of the singular second-person pronoun thou (often written tha) and thee. This is a T form in the T–V distinction, and is largely confined to male, mostly older speakers. Were can be used in place of was when connected to a singular pronoun. The reverse – i.e. producing constructions such as we was and you was – is also not unheard of. While is often used in the sense of until (e.g. unless we go at a fair lick, we'll not be home while seven.) Stay here while it shuts might cause a non-local to think that they should stay there during its shutting, when the order really means that they should stay only until it shuts. Joseph Wright wrote in the English Dialect Dictionary that this came from a shortening of the older word while-ever. The word self may become sen, e.g. yourself becomes thy sen, tha sen. Similar to other English dialects, using the word them to mean those is common, e.g. This used to be a pub back in them days. The word right is used to mean very or really, e.g. If I'm honest, I'm not right bothered about it. As in many non-standard dialects, double negatives are common, e.g. I was never scared of nobody. The relative clause may be what or as rather than that, e.g. other people what I've heard and He's a man as likes his drink. Alternatively there may be no relative clause, e.g. I've a sister lives there. In informal Yorkshire speech, negatives may be more contracted than in other varieties of English. These forms are shown in the table below. Although the final consonant is written as [t], this may be realised as [ʔ], especially when followed by a consonant. Hadn't does not become reduced to [ant]. This may be to avoid confusion with hasn't or haven't, which can both be realised as [ant]. Scandinavian York (also referred to as Jórvík) or Danish/Norwegian York is a term used by historians for the south of Northumbria (modern day Yorkshire) during the period of the late 9th century and first half of the 10th century, when it was dominated by Norse warrior-kings; in particular, used to refer to York, the city controlled by these kings. Norse monarchy controlled varying amounts of Northumbria from 875 to 954, however the area was invaded and conquered for short periods by England between 927 and 954 before eventually being annexed into England in 954. It was closely associated with the much longer-lived Kingdom of Dublin throughout this period. The Yorkshire Dialect Society exists to promote and preserve use of this extensively studied and recorded dialect; there is also an East Riding Dialect Society. The Yorkshire society is the oldest of the county dialect societies; it grew out of the committee of workers formed to collect material for the English Dialect Dictionary. The committee was formed in October 1894 at Joseph Wright's suggestion and the Yorkshire Dialect Society was founded in 1897. It publishes an annual volume of The Transactions of the Yorkshire Dialect Society; the contents of this include studies of English dialects outside Yorkshire, e.g. the dialects of Northumberland, and Shakespeare's use of dialect. The director Ken Loach has set several of his films in South Yorkshire and has stated that he doesn't want actors to deviate from their natural accent. The dialect is strongest in the 1969 film Kes, filmed around Barnsley with local actors, and in the 1977 film The Price of Coal, which had actors from across South Yorkshire. The films The Gamekeeper (1980), Looks and Smiles (1981) and The Navigators (2001) were all set in Sheffield. Loach has noted that the speech is less regionally-marked in his more recent films and has attributed this to changing speech habits in South Yorkshire. In addition, parts of his serial Days of Hope featured dialect from a more rural part of Yorkshire, with the lead actor, Paul Copley, being from Denby Dale. Dialect of the northern dales featured in the series All Creatures Great and Small. A number of popular bands hail from Yorkshire and have distinctive Yorkshire accents. Joe Elliott and Rick Savage, vocalist and bassist of Def Leppard; Alex Turner, vocalist of the Arctic Monkeys; Jon McClure, of Reverend and The Makers; Jon Windle, of Little Man Tate; Jarvis Cocker, vocalist of Pulp; and Joe Carnall, of Milburn and Phil Oakey of The Human League are all known for their Sheffield accents, whilst The Cribs, who are from Netherton, sing in a Wakefield accent. The Kaiser Chiefs originate in Leeds, as does the Brett Domino Trio, the musical project of comedian Rod J. Madin. Graham Fellows, in his persona as John Shuttleworth, uses his Sheffield accent, though his first public prominence was as cockney Jilted John. Toddla T, a DJ on BBC Radio 1 and 1Xtra, has a strong Sheffield accent and often uses the phrase "big up thysen" (an adaptation into Yorkshire dialect of the slang term "big up yourself" which is most often used in the music and pop culture of the Jamaican diaspora). Similarly, grime crews such as Scumfam use a modern Sheffield accent, which still includes some dialect words. Actor Sean Bean normally speaks with a Yorkshire accent in his acting roles, as does actor Matthew Lewis, famously known for playing Neville Longbottom in the Harry Potter films. Wallace of Wallace and Gromit, voiced by Peter Sallis, has his accent from Holme Valley of West Yorkshire, despite the character living in nearby Lancashire. Sallis has said that creator Nick Park wanted a Lancashire accent, but Sallis could only manage to do a Yorkshire one. The late British Poet Laureate, Ted Hughes originated from Mytholmroyd, close to the border with Lancashire, and spent much of his childhood in Mexborough, South Yorkshire. His own readings of his work were noted for his "flinty" or "granite" voice and "distinctive accent" and some said that his Yorkshire accent affected the rhythm of his poetry. The soap opera Emmerdale, formerly Emmerdale Farm, was noted for use of Broad Yorkshire but the storylines involving numerous incomers have diluted the dialect until it is hardly heard. In the ITV Edwardian/interwar period drama Downton Abbey, set at a fictional country estate in North Yorkshire between Thirsk and Ripon, many of the servants and nearly all of the local villagers have Yorkshire accents. BBC One series Happy Valley and Last Tango in Halifax, both from creator Sally Wainwright of Huddersfield, also heavily feature Yorkshire accents. In the HBO television adaptation of George R.R. Martin's Game of Thrones, many of the characters from the North of Westeros speak with Yorkshire accents, matching the native dialect of Sean Bean, who plays Lord Eddard "Ned" Stark. Several of the dwarves in the Peter Jackson film adaptation of The Hobbit, namely Thorin Oakenshield, Kíli and Fili, speak with Yorkshire accents. The character of the Fat Controller in the Thomas and Friends TV series, as voiced by Michael Angelis, has a broad Yorkshire accent. "On Ilkla Moor Bar t'At", a popular folk song, is sung in the Yorkshire dialect and accent and considered to be the unofficial anthem of Yorkshire. Actress Jodie Whittaker keeps her native Yorkshire accent in her role as the Thirteenth Doctor in Doctor Who. ^ Keane, Peter. "Tyke: It's all the Vikings' fault (sort of)". BBC Bradford and West Yorkshire. BBC. Retrieved 16 April 2008. ^ "Can I help you!". BBC Bradford and West Yorkshire. BBC. 5 October 2006. Retrieved 5 January 2007. ^ Petyt (1985), p. 327. ^ "Royston Accent Stands Out". We Are Barnsley. 2 May 2013. Retrieved 4 May 2013. ^ "Your Voice, Accentuate the positive". BBC. March 2007. Retrieved 28 December 2010. ^ a b c d e f g Stoddart, Upton & Widdowson (1999), p. 74. ^ Petyt (1985), pp. 94, 201. ^ a b c Williams & Kerswill (1999), p. 146. ^ Williams & Kerswill (1999), p. 143. ^ Watt & Tillotson (2001). ^ Petyt (1985), pp. 124–132. ^ Petyt (1985), pp. 217–218. ^ Petyt (1985), p. 218. ^ a b Williams & Kerswill (1999), p. 143, 146. ^ a b Williams & Kerswill (1999), p. 147. ^ Tidholm, Hans. The Dialect of Egton in North Yorkshire. pp. 49–50. JSTOR 413603. ^ Williams & Kerswill (1999), p. 146, 156–159. ^ a b c Stoddart, Upton & Widdowson (1999), p. 75. ^ Tidholm, Hans. The Dialect of Egton in North Yorkshire. pp. 98–99. JSTOR 413603. ^ Lewis, Jack Windsor. "The General Central-Northern, Non-Dialectal Pronunciation of England". points 4–13. Retrieved 6 June 2014. ^ Petyt (1985), pp. 168–172. ^ Petyt (1985), pp. 132–137. ^ a b Petyt (1985), p. 205. ^ a b c d Stoddart, Upton & Widdowson (1999), p. 76. ^ Petyt (1985), pp. 146–147. ^ Petyt (1985), p. 147. ^ Wells (1982), p. 368. ^ Williams & Kerswill (1999), p. 159. ^ Wright, Joseph (1892). A Grammar of the Dialect of Windhill. London: Trübner & Co. p. 91. ^ Stoddart, Upton & Widdowson (1999), p. 79. ^ Petyt (1985), pp. 216–217. ^ Petyt (1985), pp. 196–198. ^ Petyt (1985), pp. 239–240. ^ Petyt (1985), pp. 202–203. ^ Petyt (1985), pp. 191–193. ^ Petyt (1985), pp. 190–191, 233. ^ Petyt (1985), pp. 373–379. ^ Petyt (1985), pp. 193–194. ^ Petyt (1985), p. 236. ^ Wright, Joseph (1905). English Dialect Dictionary Volume 6: T-Z. London: Henry Frowde. p. 458. ^ Petyt (1985), p. 231. ^ a b Petyt (1985), p. 238. ^ Petyt (1985), pp. 182–183. ^ Petyt (1985), p. 183. ^ "Guthfrith I Hardicnutson Norse King of York". Britannia.com. 24 October 2007. ^ "The Scandinavian Kingdom of York / Jorvik". HistoryFiles.co.uk. 24 October 2007. ^ Petridis, Alex (15 April 2006). "Made in Sheffield". The Guardian. Retrieved 26 November 2009. ^ McCudden, Louise (13 July 2009). "Reverend and the Makers, Koko, July 8th". In the news. www.inthenews.co.uk. Retrieved 26 November 2009. ^ Dean, Will (31 January 2007). "Little man tate about what you know". Drowned in Sound. Retrieved 26 November 2009. ^ Burton, Jane (November 1995). "Cocker of the North". Telegraph Magazine. Retrieved 15 July 2010. ^ "Milburn"These are the facts"". Canadian Content. canadiancontent.net. 1 July 2007. Retrieved 17 May 2012. ^ Campling, Katie (28 January 2008). "Interview: Cribs' Ryan Jarman". Huddersfield Daily Examiner. Retrieved 26 November 2009. ^ "The Syndicate". Matthew-Lewis.com. Retrieved 6 June 2014. ^ "Macbeth – Reviews – Daily Telegraph". Compleatseanbean.com. Retrieved 6 June 2014. ^ "Wallace and Gromit star Peter Sallis confesses he can't stand Wensleydale cheese". 6 November 2009. Retrieved 9 June 2016. ^ Ford, Mark (6 November 2008). "The Myths of Ted Hughes". The New York Review of Books. NYREV Inc. Retrieved 26 November 2009. ^ Anon. "Ted Hughes (1930–1998)". Faber and Faber. Retrieved 26 November 2009. ^ Armitage, Richard. "The Ted Hughes Letters". Richard Armitage Online. RichardArmitageOnline.com. Retrieved 26 November 2009. ^ Anon. "Ted Hughes: Biography". ExampleEssays.com. Retrieved 26 November 2009. ^ Brockes, Emma (11 March 2016). "Happy Valley has become Britain's version of The Wire". The Guardian. Retrieved 28 March 2016. ^ Corner, Natalie (16 February 2016). "BBC bosses blame accents yet AGAIN over Happy Valley sound issue because dialect is Yorkshire". The Daily Mirror. Retrieved 28 March 2016. ^ Woods, Becky (21 November 2012). "Last Tango in Halifax – TV review". The Shropshire Star. Retrieved 28 March 2016. ^ "The National Anthem of Yorkshire 'God's own county'". DKSnakes.co.uk. 24 October 2007. Archived from the original on 12 September 2007. Retrieved 6 June 2014. Several nineteenth century books are kept in specialist libraries. English Accents and Dialects collection on the British Library Collect Britain website. Guide to Yorkshire words given to international recruits to the Doncaster West N.H.S. A Glossary of Provincial Words in Use at Wakefield in Yorkshire, 1860, full book online, copyright has expired. Yorkshire Dialect from the BBC's "The Story of English." This page was last edited on 21 April 2019, at 21:49 (UTC).